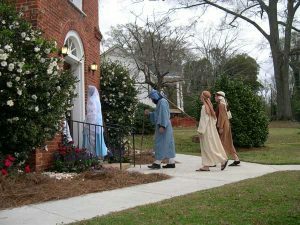 The timeless story of the birth of Jesus Christ will be portrayed and celebrated by four of Edgefield’s downtown churches on Sunday, 9th of December at 3:00 pm. The presentation is hosted by the Edgefield County Historical Society and is free to the public. 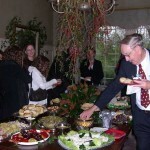 Each year the event draws a large following and has become one of Edgefield’s much anticipated Christmas celebrations. Each of the churches will present a fifteen-minute program that will include choirs, solos, congregational singing and readings. 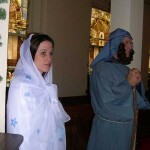 The tour begins at the Catholic Church with a program prophesizing the coming of a savior and of Mary and Joseph’s journey to Bethlehem. 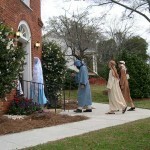 Mary and Joseph and the Prophet Isaiah will then lead the congregation to the Baptist Church where, following the program, shepherds will join the procession. 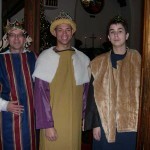 The next stop is the program at the Episcopal Church, following which the Three Wise Men, Herod and the Chief High Priests add to the cast of biblical actors leading the tour. The final stop is the Methodist Church where the birth of Christ in a manger is celebrated. Local church bells will be peeling as people progress from church to church. The tour lasts approximately an hour and twenty minutes. A bus will be available for those who do not wish to walk. After the tour ends, hot apple cider and Christmas treats will be served at Magnolia Dale, across from the Methodist Church.